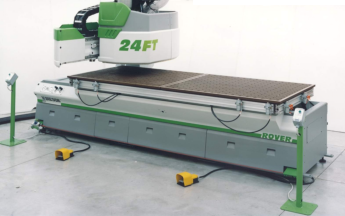 January 2012 3D Cabinet design + Optimisation For may companies that own CNC Equipment our Polyboard design software represents extremely good value, both for companies with older PTP CNC machines and the increasingly popular flat table nesting machines. However Polyboard does come in multiple versions, with the CNC version being the highest level. What this means is that for companies that do not use CNC machines they have the choice of two lower versions of Polyboard that are cheaper in price but do not sacrifice design capability. For companies that are looking at the these lower versions would typically be looking at software that will meet their design needs,. i.e. being able to design and create their own furniture and cabinets in the way that they want. 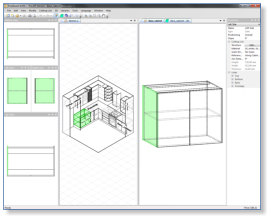 Many software systems are purely based on pre-created libraries of cabinets, whereas all versions of Polyboard allow you to design cabinets the way you make them. All versions provide an automatic cutting list, and Polyboard is a purely 3D based design system. So not only are you able to generate 3D Drawings and rendering of your cabinets and rooms, but even when designing your cabinets from scratch it is done in a 3D environment so you can see clearly what you are doing. 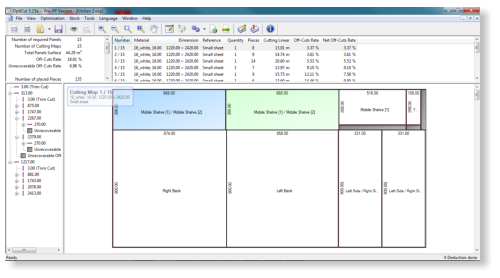 As we explained in detail last month, the decision to use optimisation is really clear: if you cut your parts on a panel or Beam saw, and you are already geting your cutting list automatically generated from design software, you should be using sheet optimisation software. As we mentioned, The connection is seamless between Our design software Polyboard and our optimisation Opticut. Its simply a matter of a couple of click and you have optimised all your parts and because Opticut is a Multi-format program it will optimise all the different materials in your job at once and in a few moments you know exactly how many sheets you need what your waste will be and ready to go cutting layouts ready to be cut. To start off the new your we are offering great discounts on orders for Polyboard + Opticut software packages. this represent good savings off our already good value products. To receive this discount please contact us, and mention you read this article. Send us your feedback! Please use the form below to let us know what you thought of these articles. We aim to include more varied topics so if you could suggest ideas it would be great to hear from you. February 2012 New Tutorial Videos and Trial Downloads As you may have noticed we have added a new videos page to our website. We have begun by adding basic and then more advanced videos on our cabinet design software Polyboard. Over the next coming months we will progressively be adding more videos. Although we provide excellent training services for our customers at reasonable rates, we have had requests for additional training material to be provided, and in addition to supplementing our one on one training services these videos also provide an opportunity for customers who are located at a distance from our office to get a good feel for the software. If you have taken advantage of our free demo download of the software please take the time to view some of these videos so that you can get the most out of your trial and also pick up some good pointers in using the design aspects. Although our software is designed to be very easy to use, a first time user may be a little lost, or not know exactly where to get started, so these videos will be very useful to them. 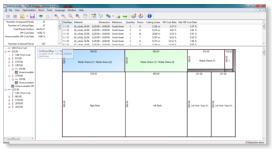 The actual demo versions of our software are not limited in terms of design. 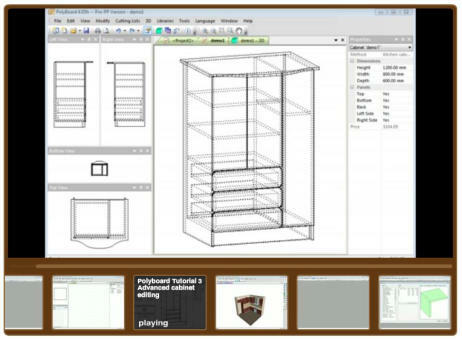 You can create and save complete cabinets and have access to all design related features. They only restrict you in terms of output. As you cannot export cut-lists or CNC files and cannot print reports. 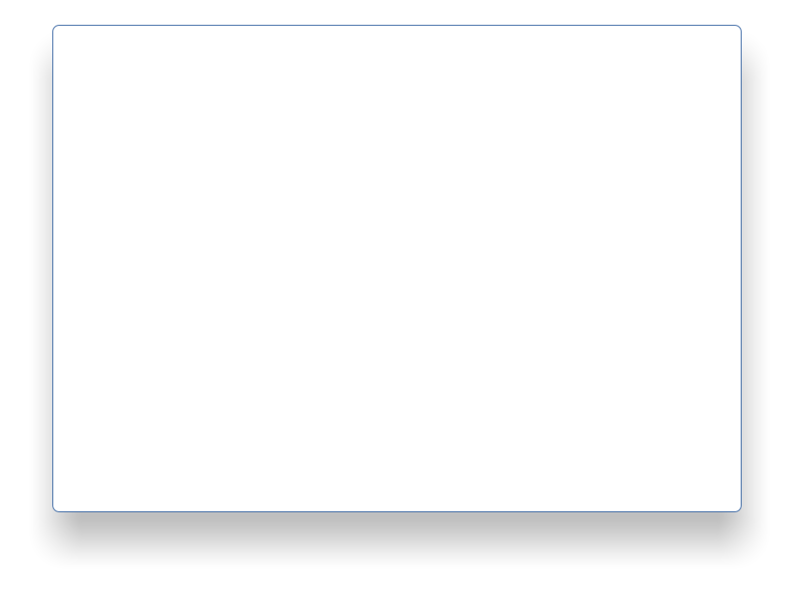 If you would like to test the output of the software please feel free to email me your test design and I can send you back the sample output from Polyboard for your confirmation and testing. Over time we will be adding more videos and both of Polyboard and our other software products, and of course if there is a particular video you would like us to create or are still unsure about any aspect of our software please don’t hesitate to Call or send an email to us. 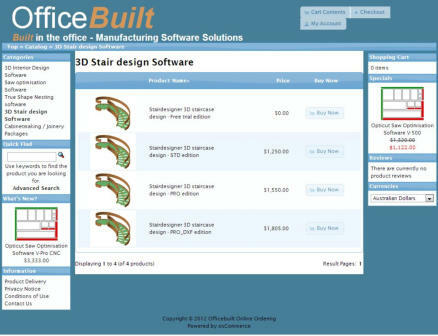 September 2012 New Online Store We are pleased to announce the formation of our new online store: Officebuilt online ordering. The new sore will provide easy access to our software versions and pricing as well as a safe and secure way of ordering our products on-line. at the moment software products can be ordered via Paypal express checkout or you have the option of checking out with the bank deposit option and whereby we will send you an invoice for your total. We are progressively adding our range of software products to the on-line catalogue. In addition to our paid versions there is also free trial versions that customers are free to create an on-line account, order a free version and proceed to the download area for the trial download. The on-line store also allows the ability to share our products amongst the social networking sites, and recommend them to friends and associates, as well as also the built in ability to write reviews on our products. July 2012 Polyboard to Optinest seamless transfer complete This month we have completed the requirements necessary for a seamless transfer from Polyboard to Optinest. As you may know Optinest is a true shape nesting package that has a very competent calculation algorithm (Calculation method) which results in a very tight nest and maximum material savings. 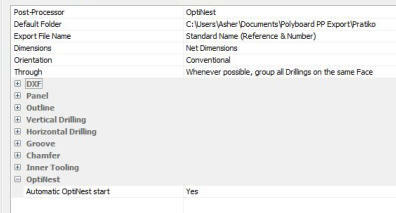 In doing so Optinest has been added to the list of post-processors in Polyboard and upon exporting a cabinet or an entire project the parts list is automatically loaded inside Optinest. 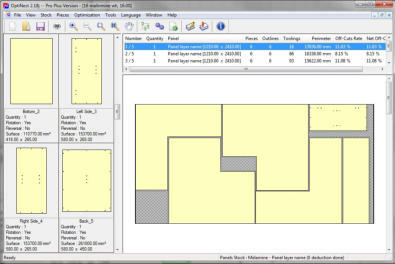 From here it’s just a few clicks away from nesting your parts and producing dxf files, of the nested sheets. For a complete nesting package we can now offer Polyboard - Optinest - Pratiko with Gcode generation for any cnc machine. 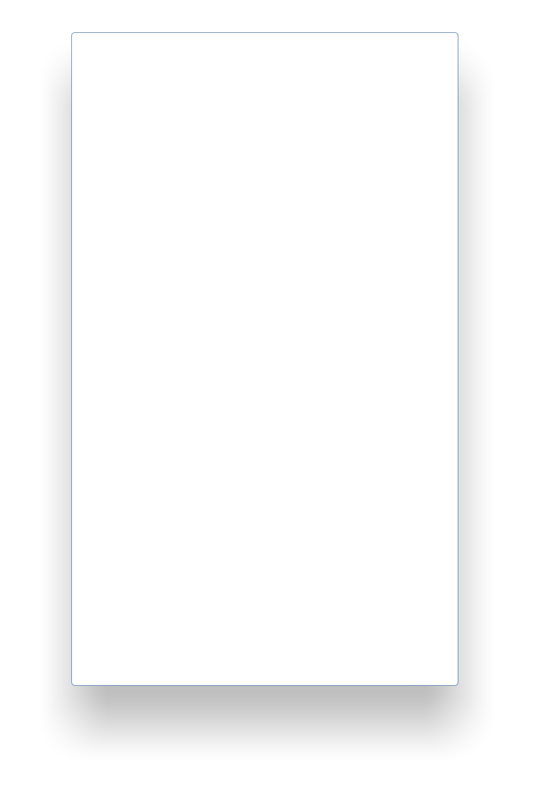 However many machines with proper setup can take the dxf files from Optinest directly and run them. If you are using nesting software why not take Optinest for a test drive and be surprised how much material it can save you over your current nesting software.